and fascinating trio not to be missed under any pretext! Mounir Troudi is a Tunisian poet and singer with multiple influences, from Sufi singing to jazz. A traditional Breton musician, Erwan Keravec is a bagpipe bell ringer. Wassim Hallal is a French- Lebanese percussionist with varied repertoire (dabkeh, gypsy music, etc.). their music promises riches, experiences and beauty. 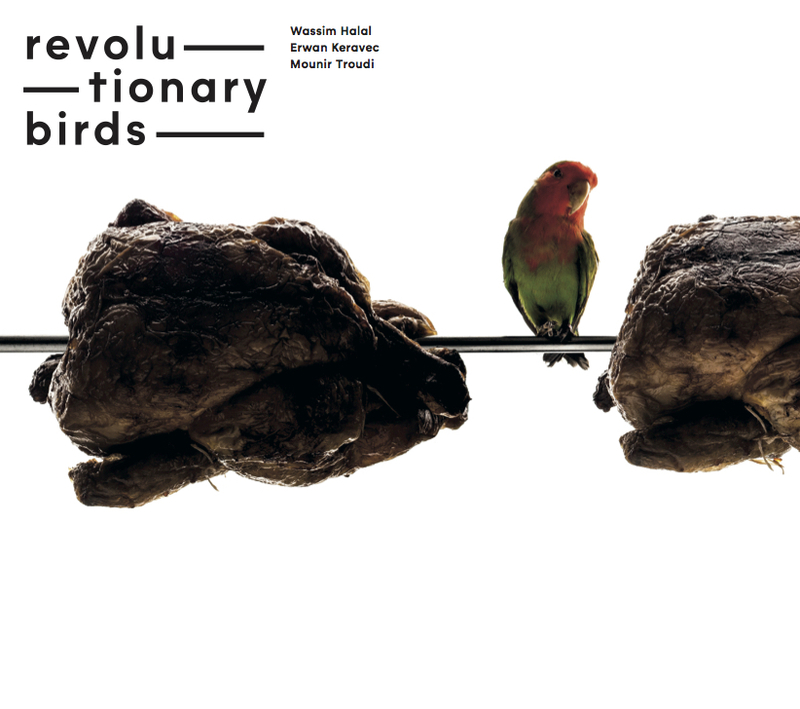 Revolutionary Birds are Wassim Halal on darbuka and daf from Lebanon, Breton Erwan Keravec on bagpipes and Sufi vocalist Mounir Troudi from Tunisia. They came together at LaVoix est Libre in Paris and the Irtijal Festival in Beirut in 2015 and what a sound they make ! Rarely have I heard a cross-cultural collaboration as seamless as this. All three musicians play in total sympathy with each other, no member is dominant, and the sound they create is unenforced. Incredibly they all sound as if they were nurtured by the same tradition. The music is innovation and authenticity in equal measure. Strong in tradition but with a healthy desire to experiment and push the boundaries of their source materials and their instruments. The opening track Raks, which is also reprised live at the end of the CD, pretty much sums the band up. Recorded without overdubs their fullness of sound is generated by radical approches to their ways of singing and playing. Willing to improvise, but firmly in the tradition, Keravec’s bagpipes open the CD with a staccato, broken riff which sounds part mediaeval, part synth sequencer, leaving lots of space for darbuka and the trance-like, hypnotic, devotional singing of Troudi’s singing is spiritually elevated and absorbed in its own creation which gradually unfolds to the listener. Improvisation at the highest level. Erwan Keravec’s pipe sound is something to be heard! after starting with a punctuated opening riff, he often adds a second riff in a lower or higher pitch. This creates a counterpoint with sounds like a second bagpipe has joined the band. Likewise percussionist Halal creates a multiplicity of tones swapping with ease from the daybreak to the dad to create a complete change of musical atmosphere. An amazing trio of unique talents. 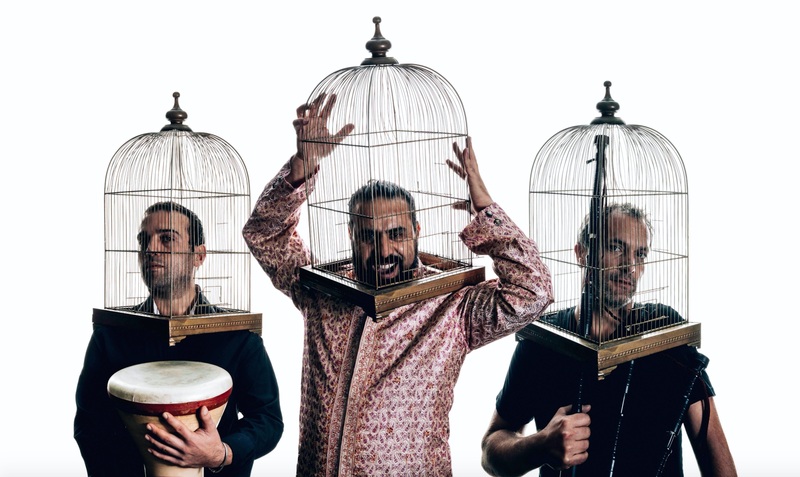 Revolutionary Birds is a striking new collaboration between Tunisian jazz and Sufi singer Mounir Troudi, Breton bagpiper Erwan Keravec, ad French-Lebanese percussionist Wassim Halal. Their playing has an unmistakable sense of freedom and spontaneity to it, and the whole album bristles with creative energy. On the opening track, « Raks », soaring melismatic vocals are propelled forward by the drone and repeating patterns of bagpipes, while on « Turc » the voices and pipes take turns in lifting up and over each other. The fifth track on the album, « Le rêve d’Achille », is what I would imagine a Sufi ceremony would sound like if it took place on a drizzly day in the Scottish Highlands, with the drone of the bagpipes sounding alone for long stretches in order to provide a sonic canvas (as the tambura does within Indian classical music). It’s a clever trick, and one that imbues the bagpipes with a meditative and sometimes foreboding quality. I could have done without an additional live version of drakes » (which seems too similar to the original to warrant inclusion), but revolutionary Birds is a compelling work that balances heaviness and light in equal measure. The multi-disciplinary Tunisian singer Mounir Troudi, the Erwan Keravec and the French- Lebanese percussionist Wassim Hallal have chosen to make their common work, their individual inspirations and their collective aspirations open to each other and to the other. Elsewhere and a powerful and free message celebrating art and humanity. Medina. The Breton phrase also in a virtuoso manner supported by a drone in C right as a minaret.